The PDF eBook offers live links to over 300 mystery shopping company websites, so order both! Chapter 2: What Tools Do I Need? Whether you range in age from teenager to senior, you can be a mystery shopper. Everyone is looking for ways to increase their income, but with jobs so limited, it is very hard. This book will teach you where to go to eat, how to shop at your local grocery store, get gas and other necessities and be paid for it or at least get your money back. "'The Essential Guide To Mystery Shopping' is the best book on mystery shopping to come along in years! I couldn't put it down once I started reading! After seven years as a mystery shopper, I found myself nodding my head in agreement at the suggestions. It's a must have for mystery shoppers." "I have known Pam for as long as I have been shopping. Whenever in need of advice, I have turned to her as she has been through everything and anything that can happen to a shopper! Years of experience combined with the heart of a teacher have led her to share her knowledge in 'The Essential Guide to Mystery Shopping.' It should be required reading for every Mystery Shopper!" "Pam knows thoroughly the ins-and-outs of the mystery shopping trade; from locating the most stable and best-paying companies, to the most effective ways to communicate with mystery shopping firms, and to identifying and utilizing the tools and skills that are of most benefit to both seasoned and novice mystery shoppers. This is an ever-changing business and there is always something new to learn; this book is truly essential." "Regardless of my 10 years of full time experience, telling friends and family how to get into mystery shopping was no easy task. No matter what, it was so overwhelming for them, to the point of giving up. PamInCa wrote this book with meticulous fashion and detail that a clueless breakout mystery shopper would feel guided in the right direction." 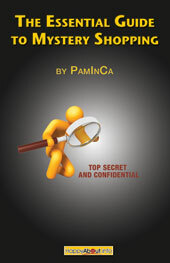 PamInCa [Note: her pen name] is a Gold Certified mystery shopper. She has been mystery shopping for eight years and decided to write a book to help people who want to learn all of the ins and outs of this fantastic business. She has completed over 16,000 mystery shops from apartments to casinos. For the last four years she has taken jobs that she would not normally take for the sole purpose of research for this book. She has not paid for groceries, gas, dining out, office supplies or even hotels for the last eight years.